Marshalls' high containment kerbs have been specifically designed to provide passive traffic control and keep vehicles on their intended path, acting as a deterrent to overriding by vehicles. Marshalls' specialist products help to keep roads safe for both drivers and pedestrians thanks to effective segregation. The Titan Specialist Vehicle High Containment Kerb provides a clear visual warning to drivers. At 400mm in height, it acts as a passive control system to protect vulnerable street installations such as pedestrian refuges. 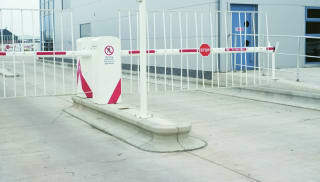 The high containment kerb can also be used in bus stops for safe and easy pedestrian access. For details on high containment kerb prices and usage, get in touch with our team today.